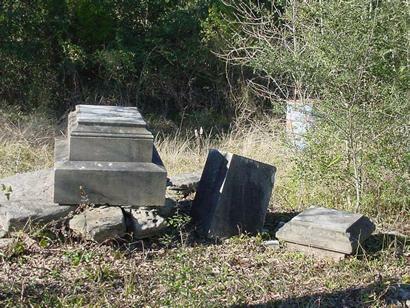 Brenham Texas Yellow Fever Cemetery aka Masonic Cemetery or Wilderness Cemetery. "Brenham's citizens buried many loved ones here in the latter part of 1867 as an epidemic swept through the area." On the north side of Brenham off Highway 36 N (aka as Loop 283), the cemetery is on the unpaved Old Masonic Road, just behind a housing project and not far (NW) of the Brenham High School. A new gate and a historical marker were set in place in 2002. 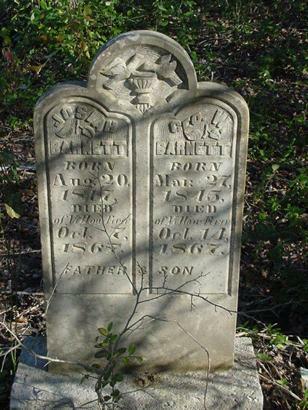 A few tombstones indicate the cause of death - as on this twin headstone for a father and son who died four days apart in 1867. 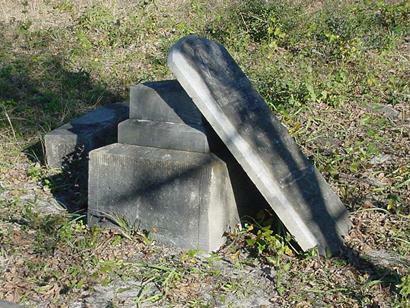 "Numerous gravestones dating from the early 1840s... Brenham's citizens buried many loved ones here in the latter part of 1867 as an epidemic swept through the area; the site has been commonly known as the Yellow Fever Cemetery ever since. Laid to rest here are: pioneers, veterans of the War of 1812, the Texas revolution and the Civil war..."
Perhaps due to its location, the cemetery (which once held 122 graves) has been heavily vandalized. Many of the graves are now unmarked or have had the tombstones pushed from their original locations. The cemetery committee of Graham Lodge No. 20 ( the local Masonic Lodge) has been making slow but steady progress on the cemetery. After roughly 20 man hours of work, the headstone of Patrick Lusk has been re-installed on its original marble base. We had to dig down 18" to get under the base so we could level it. That was an all day chore, but it's now level and the headstone is back in place. Mr. Patrick Lusk was a member of the Mier Expedition and was a survivor of the infamous black bean incident. So, it was appropriate that his was the first stone repaired and replaced. We continue to have work parties on weekends. The local Masonic Lodge in Brenham, Graham Lodge No. 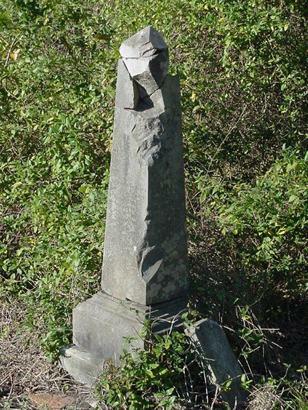 20, has formed a committee to oversee the repair and renovation of the Yellow Fever Cemetery in Brenham. The committee was formed in July 2015 and consists of Dr. Robert Stark, Glen Grantom, John Fuller and Kirby Simmons. The committee is developing a preliminary report of the condition of the cemetery and what needs to be done to improve the condition and rehab many of the headstones which are broken. The committee is also interested in obtaining any information from relatives of the people interred. Secretary-Graham Lodge No. 20 A.F.& A.M.
A rescued stone leans against the base of another. Dear TE, Glad to find your magazine. 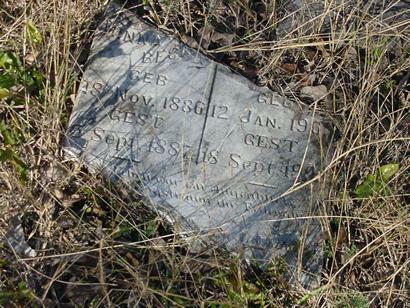 We did not think anyone knew of or cared about the Old Yellow Fever Cemetery in Brenham. My great grandfather�s (Bolling Eldridge) first wife, Kate Hurley Eldridge, is buried there along with a few other Eldridges and Hurleys. 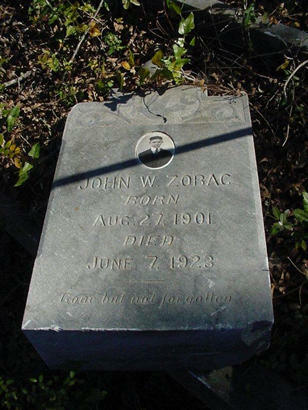 We first found the cemetery in 2005 on our honeymoon. We cleaned up our area, and even cleaned the tombstones to read the beautiful inscriptions/dedications on them. They had such an eloquence and respect in speech back then. We made a trip to Yellow Fever Cemetery in Brenham Texas this morning using the directions on the web site, the directions need to be changed some, they have closed part of the Old Masonic Road off that goes behind the new housing area that has been built next to the cemetery. Better directions should be take Highway 36 north turn on Dupree Drive take first left which will be Old Masonic Drive and cemetery is just to the right. 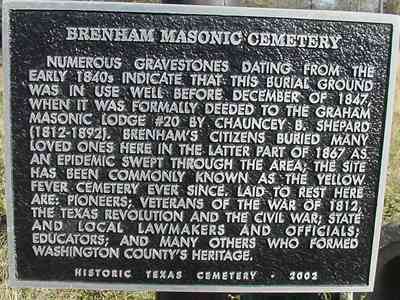 Dear TE: I have emails out to 4 or 5 places for directions [to Brenham's Old Masonic/Yellow Fever Cemetery] without any answers so far. I never thought I would find directions on TexasEscapes. My sincere thanks for having it on your website.